David Rumph Jones (April 5, 1825–January 15, 1863) was a Confederate general in the American Civil War. Jones was born in Orangeburg, South Carolina. By his marriage to Sarah Taylor, daughter of Brig. Gen. Joseph Pannell Taylor, he was a nephew of Zachary Taylor, the twelfth US president, and a cousin of Jefferson Davis and Richard Taylor. He graduated from the United States Military Academy in 1846 and served in the Mexican-American War. 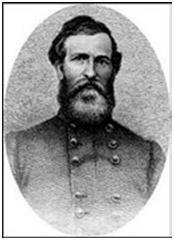 Jones was appointed a brigadier general in the Confederate army on June 17, 1861, and major general on October 11, 1862. He commanded a brigade in Brig. Gen. P. G. T. Beauregard’s Confederate Army of the Potomac at the first battle of Bull Run and then a brigade in the division of Maj. Gen. John B. Magruder in the Peninsula campaign. In the Seven Days’ Battles, he temporarily led the division when Magruder served as a wing commander. When Magruder departed for the western theater in July, Jones got permanent command, leading his troops at the second battle of Bull Run and the Battle of Antietam, in both cases under Maj. Gen. James Longstreet. At Antietam, his division held the right flank of the Army of Northern Virginia when the Union IX Corps attacked. The strain of campaigning aggravated a longstanding heart condition and Jones died in Richmond, Virginia, the following January. Source of information: Eicher, John H., and David J. Eicher. Civil War High Commands. Stanford, VA: University Press, 2001.